Baklava is a classic Greek pastry traditionally made with phyllo dough, honey, nuts, and orange essence. Many other Middle Eastern nations too have pastries which are very similar, thanks to a long running tradition of sweet desserts which feature flaky and delicate pastry. Read more about Baklava and its history here and here. Phyllo is a simple flour-and-water dough that is stretched to paper thinness and cut into sheets. It is notoriously difficult to handle, because it is so fine and easily dries out as I quickly learnt! It can be found in the freezer section of most grocery stores. More information on phyllo dough here and here. We attended a potluck party over the weekend and Baklava was one of the three dishes that we prepared. Grind the almonds, walnuts, apricots, bread crumbs, sugar, cinnamon and ground cloves to a coarse mixture in a food processor. Transfer this to a small bowl and add 2 tablespoons of the melted butter and the honey and mix well to combine. Gently press each cut piece of phyllo into the mini-muffin tin cups. Press 1 spoon of the ground mixture into each of the phyllo cups. Gather the ends of each of the phyllo squares and twist to make a little sachet. Bake until the edges of the phyllo are golden (this takes about 20 to 22 minutes.) When cool enough to handle, remove the baklava sachets and transfer to a serving plate. This recipe yields around 24 little baklavas. I followed Giada’s recipe and instructions very carefully after making a few minor modifications to the recipe. The end result was not disappointing at all. Needless to say, this Greek pastry was a great hit at the party and was completely worth all the time and effort that went into making it. This is my entry for the Middle Eastern edition of A.W.E.D. being hosted by Siri @ Siri's Corner. This is also being sent to Andrew @ Spittoon Extra for Waiter There's Something In My...Dried Fruit and Nuts. Baklava in muffin pan is new to me. I just love the filling. And I also prefer orange clover honey in it. This is one sinful dessert! This is amazing! What a tasty pastry! Only thing I need to read the instructions carefully once again. I know with the nuts filling my family will love it! TBC, I love Baklava too but I made it into layers instead. This is new to me but it looks great. Also you add the honey to the nut mixture right, the one I did we add the honey syrup after it is baked. TBC! I am beyond words for describing this. I have never seen mini baklavas before, such a great party idea too. thanks for sharing. yummy! what are you doing to me..here i am eating oatmeal for b.f and u show me baklawa...looks great!! Not heard of this dessert...They look sinfully delicious! The baklava bites look good. I've never made baklava...that is my husband's department. Yours looks so easy to make. I love them but have never ate home made ones. OH! Lots of information and a very nutritious recipe..! Enjoyed.. WOW!!! Super! i have had baklava (or something similar) just once and i loved it! not too sweet, just right! ooh! 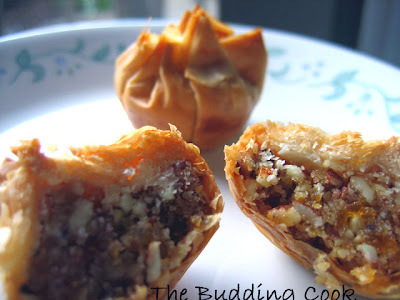 Love the idea of wrapping the baklava ingredients in the phyllo purses. I was discussing about Baklava today with one of my friend and was wondering howz made and..here I see the recipe.. :D.. thanks for sharing TBC.. they looks nutty and lovely..
Wow - great job. 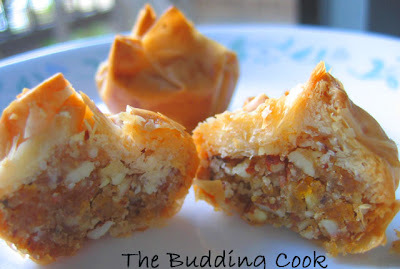 I always thought that baklava was really complicated to make but you make it sound so simple! and they look so cute! You made baklava - amazing. They look so professionally done. Great going girl. I dont think I could ever do that. Though I have not prepared it, I can imagine how delicious they must have been looking at your pictures. Your RCI entry gojju looks fabulous. BTW, Love your snack. Where did you get ripe plantains? I don't think I have seen them ever. Looks awesome. I made this 3 years back. This is my hubby's fav. You pic looks mouth watering. I'm drooling right now. OMG!!! they look so PERFECT..makes me want to pop one into my mouth :). Excellent job with the baklava. I have made it rolled and in squares but not in muffin cups. What an excellent idea!! !Wondeful phpotos as well. I wish they would jump right off the page!!! have heard so much about baklava ,but never found a workable recipe, kudos girl! I simply love baklavas. Yours are so cute. I like the way you did them. I think I'll make some soon. I'm in the mood. Suganya, baklava itself was new to me! Nags, it was very new to me too.These days pretty much everything is available there too. Maybe you would find it in one of the fancier places? Laavanya, gimme your layer-recipe. Here I added the honey + butter to the nut mix. Asha, this was by no means " easy" but I did al that work 'cos it was for a party.But the results were pretty good, so I will def make it again! Let me know if you try it. I wish it were my idea:-( but I just followed Giada's recipe with a few changes. Actually I had never heard of or tried this before. Thank you:-).It was inspired form the recipe on Food Network. Shella, thank you so much for your generous compliments. Re the plantains, I managed to locate them in my local grocery store. I'd never seen them there before.And what I got were not even the typical Kerala bananas though they came pretty close to it. I even had to add some sugar 'cos they were not sweet enough. Valli-thank you somuch for the generous compliments. Would you mind sharing your version? This was something I had never even heard of , but I liked the results and will def be making it again. Dhivya, thanks for stopping by. Do let me know how it turns out for you. Helene, I wish it was my idea!I blindly followed Giada's recipe. Please let me know when you make it. Sweet, rich little dumplings, lovingly created. Baklava is one of my many weaknesses. I better look away now... : ) Great results, TBC! hey that looks so good. nice one for a romatic dinner. I am going to try this one. That looks so scrumptious TBC! Haven't heard of this though. Will remember it and check it out in store. This is one of my top favorite desserts and you make them look so darn tasty...I love how they resemble little drops! oohh!!! I have eaten this a couple of times...too heavy to eat, but I love it:) a beautiful recipe!! 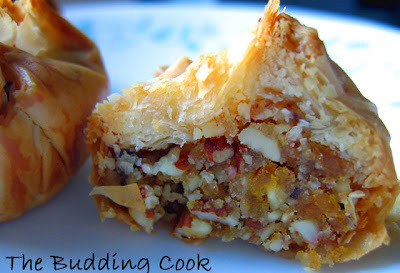 I have tasted Baklava once n loved it..will try this for sure..i have bookmarked it..
Wow TBC, it looks fantastic indeed. I think I will do this stuffing the next time and bake them in the pre baked shells. Many thanks for the submission to Waiter; looks delightful! Wow! The list of ingredients made my mouth water! I am sure that tasted great! Baklava is a Turkish dessert.Not Greek. This recipe is wrong or it is not real baklava. You have to eat to know how it is different and delicious.Go to Turkish desserts seller (for example; Gulluoglu)and eat please. You will feel the difference. Anon- thanks for leaving your comment. I was trying to look up the history of baklava, but my searches w.r.t. the origin of the pastry have produced different results. What do you mean by "the recipe is wrong"? This is how I made baklava and it worked well for me. If you'd read the post carefully, you would have seen that it is mentioned that this is a variation of the traditional recipe! Thanks for posting this recipe! I saw Giada make it on her show. Today, I looked for the recipe on food network, but it wasn't there. Long-shot to google it, but yay! Thanks again! Amanda- you are welcome. :) I've made these a couple of times now (mainly potlucks) and they have been well-received. I watch Giada's shows a lot and try out a lot of her recipes. She makes them seem so simple! Do give me some feedback if you do make them. I'm glad you're here! Thanks for stopping by. The recipes you see here are ones that have worked for me in my kitchen and have been tailored to suit my palate. There is no guarantee that it would do the same for you. Please use my recipes merely as guidelines and feel free to adapt it to cater to your needs. Please note that YOU are responsible for what you cook! Please do not use anything on this blog - photos or text - without asking first! All text and photographs Copyright © 2007-2013, The Budding Cook.